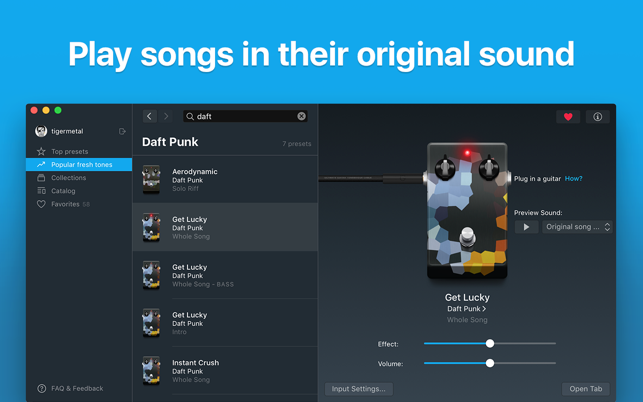 Play your favorite songs in their original sound using your Mac! It's a whole new experience in learning songs. Tonebridge gives you the sound of the original song out of the box. 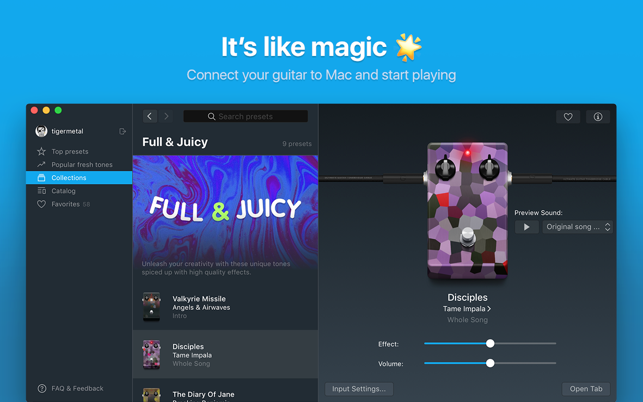 Plug in your guitar into your Mac and start playing. It’s that simple! 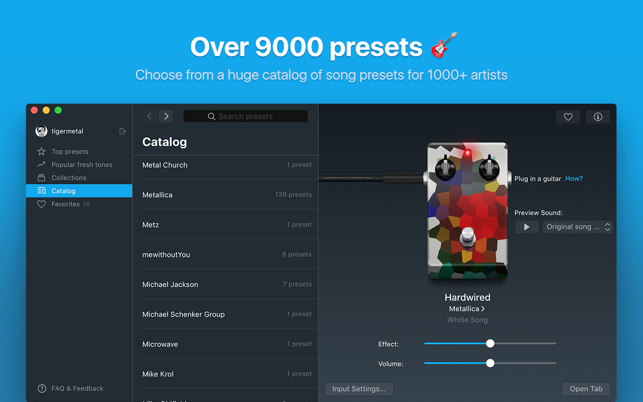 A huge collection of song presets allows you to choose effects from light acoustic sounds of "Come As You Are" to crushing heavy roars of "Master Of Puppets". HUGE UPDATE is here—introducing TONE WIZARD in Tonebridge! Just want to let you guys know that there is NO component (AU) showing in the Components folder after the update and after reinstalling the software. I tried looking in Application Support under both Logic and GarageBand, AND in both the hard drive and home folders to see if it was there and the AU (component) is nonexistent in either. What is the component titled? If I knew I could do a search and at least see if it’s installed in another location. Anyway.. I really hope to see this software as a AU.. It was actually the first thing I thought when I used it! :) :) I also wanted to add this product has HUGE potential as an AU. Not only can you find certain tones your looking to use in your OWN songs… it’s also a great tool to reamp existing tracks! You guys have a $$$ maker here imho. Hope ya can resolve the issue soon… I am DYING to try this in a existing project I’m currently working on. Anyway.. Good luck! and I promise to give a full review when this issue is resolved. Peace! First, this is free! You can examine the settings of each preset and make adjustments as you see fit. It’s interesting for gear heads to see the effects, amps and settings they chose to emulate whatever tone you are looking for. I use it with the iRig HD 2 via USB, and works great. I do have an Ultimate Guitar subscription, and together with this, I actually enjoy practicing and learning again. I’m very busy, and keep a guitar in my office to help me unwind when I need a mental break. This together with my U.G. subscription lets me get those 10 minute or so breaks in my day and have some fun. Very, very pleased. Thanks! Absolutely Brilliant with Mainstage 3! 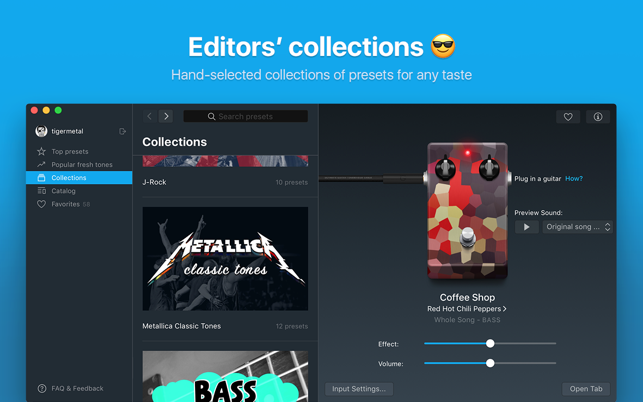 Tonebridge replaces guesswork, experimentation and $$$ with presets and guidance for guitarists seeking to reproduce the timbre of their favorite recordings. It’s worth a lot to me. 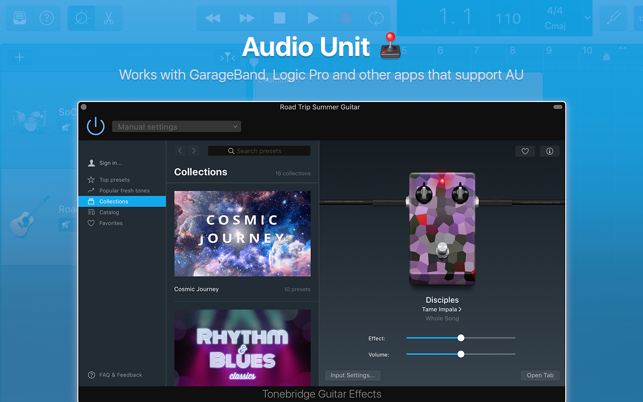 To use Tonebridge as an AU plug-in for Mainstage 3 (fixing the “!”), enable it in AU3 Mode after opening a concert: Mainstage 3 > Preferences > Plug-in Manager > UGTB > Tonebridge Guitar Effects > Check “AU3 Mode”. An entire Audio FX “rack” can then be replaced by Tonebridge. I set it for “Let It Be - The Beatles - Solo” and started focusing on my technique instead of the gear: Noise Gate > Compression Pedal > Distortion > Amp > Delay > Echo > EQ > Cabinet > Mike all selected and adjusted appropriately. Every guitar and rig sounds different and every guitarist seeks their own sound so there’s still some tweaking to be done, but it’s a great starting point for dialing in the right tone for each song instead of compromising with the same “rack” for an entire set.